Encourage creativity and imagination to blossom over spring break. 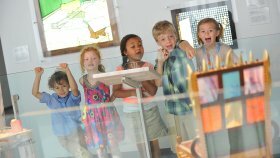 Visit the Museum for lots of family-friendly activities that will keep both you and the kids busy and happy. Admission for kids and teens is always free, and local residents (living in ZIP codes beginning with 148, 149, or 169) can visit for just $9.75, making the full line-up of events and activities an affordable option for families of all sizes. Submit a drawing of something you’d like to see come alive in glass. Your drawing could be picked by one of our glassmakers to make in front of a live audience during a Tuesday or Saturday Hot Glass Demo in the Amphitheater Hot Shop. Drawings will be collected throughout the week for creation during the Hot Glass Demos on April 23 and 27. Want even more You Design It; We Make It!? Flameworkers will choose one drawing every day which they will create during the Flameworking Demo in the Innovation Center. Make a spring egg, an egg pendant, or even our all new lamb bead! Plus, try suncatchers and windchimes that catch sunny rays every day. Additional fee. Projects are for all ages. We recommend booking ahead of time. Watch as expert glassmakers transform molten glass into beautiful objects at the live, narrated Hot Glass Shows. Don’t miss the Flameworking, Glassbreaking, and Optical Fiber Demos. All demonstrations are included in the cost of admission. Explore the biodiversity of our community through a variety of activities. Come along on guided nature walks and discover what’s living and growing around the Museum. Photograph trees and wildflowers. Inspect an insect. Use glass to investigate the world around you. Take a peek through binoculars while birdwatching. Search for tiny tardigrades with a microscope. Schedule changes daily. Kids can explore the galleries and find glass objects inspired by spring to create their own glass bouquets.